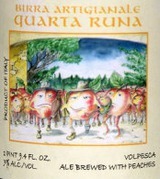 Quarta Runa is a bright, hazy orange golden ale brewed with fresh local Volpedo peaches. The peaches are added during fermentation when the activity of the yeast reaches the maximum vigor. The peaches are heated to 392 degrees F in an oven before being added in order to increase the flavor intensity and eliminate the wild yeasts. The aroma is light and fresh with scents of peaches and yeast. The initial flavor is sweet and spicy with some cinnamon notes, fresh sugary peaches and citrus. Quarta Runa has a very refreshing crisp and smooth long finish which also shows an unexpected and mild hopping.